If you are a results oriented professional with a flair for problem solving, TrainingConnections is the right place for your talents. 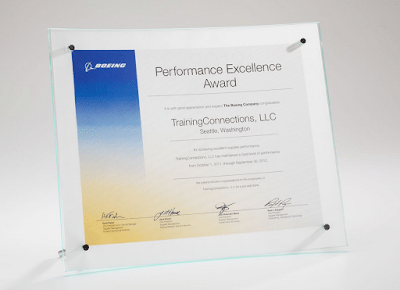 TrainingConnections, LLC is a recipient of a Boeing Gold Performance Excellence Award for every year between 2009 - 2017. TrainingConnections, LLC is one of only 153 suppliers to receive the Gold level of recognition achieving this status for five consecutive years. The TrainingConnections team, made up of Career Advisors, Instructional Designers, Educators, Trainers and other professionals, is commited to delivering world-class service that is customized to maximize each client's results. Career Advisor in industrial setting to perform following varied work including: Advise program participants to develop a participant-driven individual educational/career plan and track participant progress Work closely with participants to locate internal or external educational and training resources.